A Newmarket Orangery For A Racing Stable. When you run a busy racing stable and spend a lot of your time outside in the elements, there is nothing more comforting than coming home to relax. Sitting in quiet solitude away from the demands of the business. But part of the joy of living in a place where there’s room for horses is being surrounded by countryside. To see horses grazing outside the windows and to enjoy the tranquility of your own private garden. When the owners of this Newmarket property approached the Cambridge Conservatory Centre at the Scotsdales Garden Centre, they wanted to create a space that would allow them to do just that. They were looking for privacy from the workings of the business, a place to switch off and just enjoy family life. The home already had a series of annexe buildings, each with a distinctive stone capping and ball finial but there was a spot that was just perfect to place a new room. Nestled in a corner between the main house and a high wall to the back, this Newmarket Orangery blends perfectly with the architecture of the house. In fact it’s so perfect, that it’s difficult to see where the original house ends and the orangery begins. With a high hipped roof, the home makes a stunning feature in the expansive landscape. The traditional four pane windows make beautiful shapes in the warm cream of the painted brick walls. Tall chimney stacks with ball finials soar high above the roof creating slim profiles agains the sky. 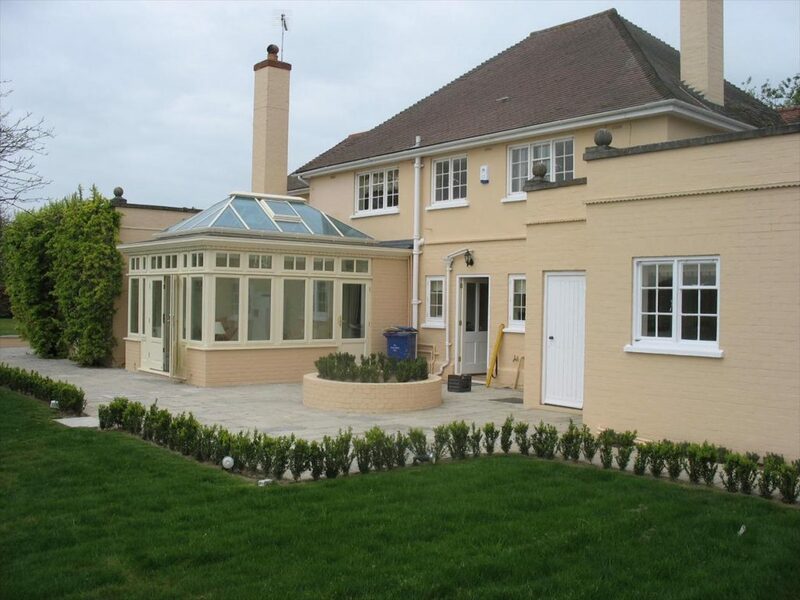 So when it came time to design an orangery that would compliment this glorious Newmarket home, the direction was obvious. 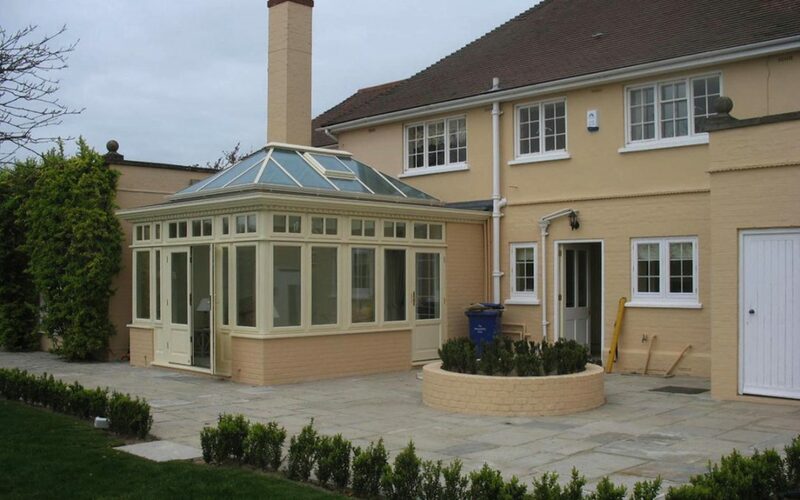 We designed a classic rectangular orangery with windows on two sides. A frieze of double paned windows sit above the tall fixed glass panes that rest on a painted brick base. 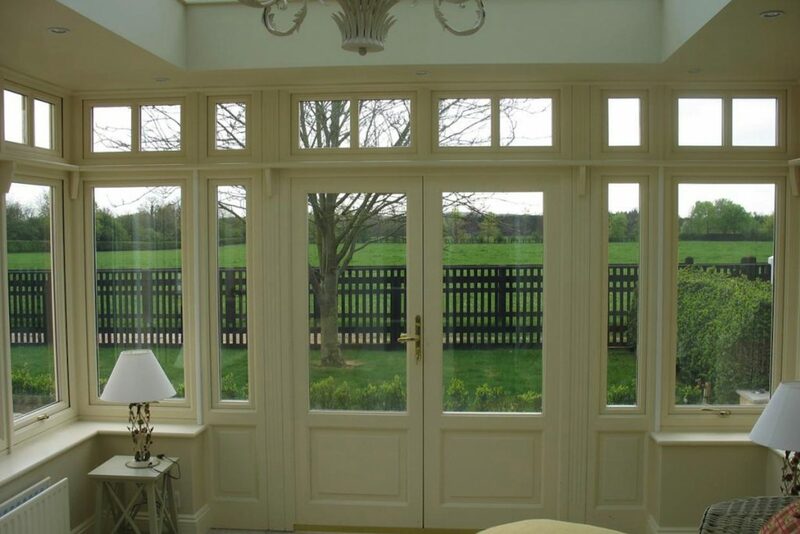 French Doors with fielded panel open directly onto a generous paved courtyard. And the fully glazed lantern roof? Well it’s a triumph. Reflecting the pitch of the hip roof on the main house, the ceiling soars high above heads. High enough to carry a stunning crystal chandelier hung from the central point of the roof. Subtle downlighting is hidden in the ceiling frame around all four sides and wall lights are fitted on the solid wall that backs onto the annexe building behind it. Whatever the owners’ mood, there is a lighting solution to match. And now that it’s finished, this Newmarket Orangery sits harmoniously if somewhat proudly in it’s beautiful surroundings. It really is the perfect spot to get away from it all.